As partisan and ideological divides kicked in, concern fell and opinion became more polarised. Now in the US, public understanding of climate is on the rebound despite the deniers’ assault, with Americans attributing their increased belief in global warming to their (correct) perception that the planet is warming and the weather is getting more extreme. 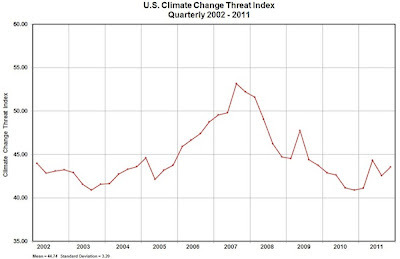 The extreme heat wave and wildfires in the US in spring and early summer July 2012 have further contributed to the rebound. And a new poll finds that most Americans say they believe temperatures around the world are going up and that weather patterns have become more unstable in the past few years. But the rise of the climate denial sector in breaking down political bipartisanship and creating confusion cannot be underestimated in derailing legislation and reducing public concern about climate harm. The media’s role is graphically illustrated in the case of the USA (see chart below). 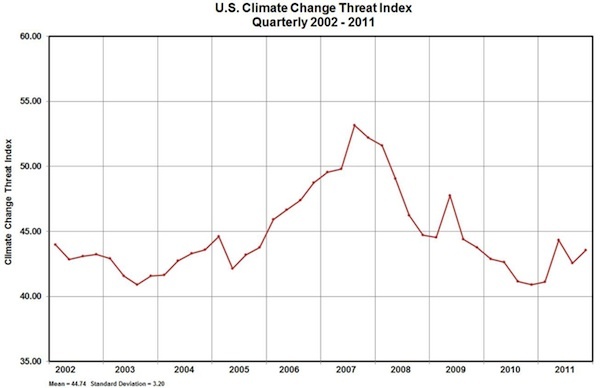 There was a second spike in 2009 in the lead up to COP15 in December, but after that it continued to drop. That case was reinforced in the minds of Australia’s media editors and producers when Rudd backflipped in early 2010 and Labor took climate off the agenda. The deniers and their collaborators in the media did the rest. 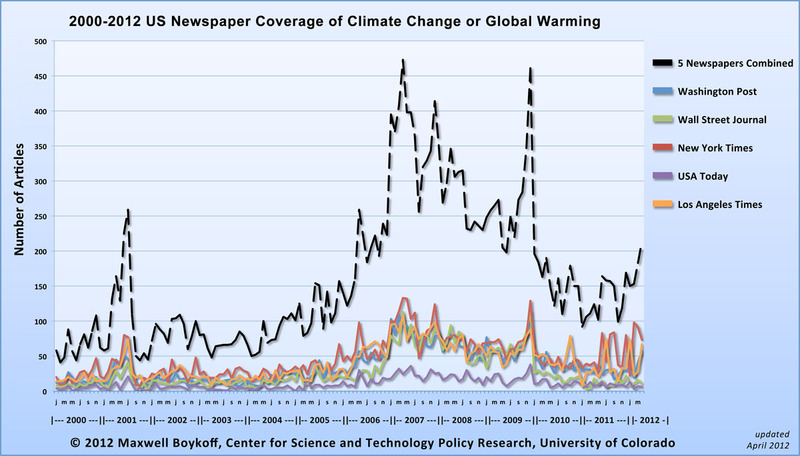 Due mainly to the efforts of News Limited and a spray of right-wing radio presenters, the deniers’ influence grew strongly just as Labor retreated on the issue. The see-saw tipped decisively. 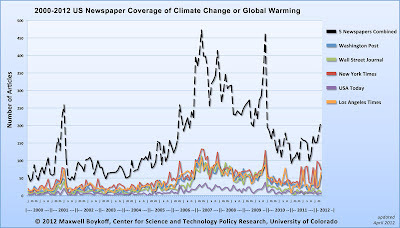 From 2010 onwards numerous journalists and reporters said that the climate issue had been downgraded in priority by management. The bright-siding of climate advocacy by the Australian government, eNGOs and some community campaigns – talking about clean energy and jobs and not talking about climate impacts – meant that for these organisations the story of climate science and impacts was simply off the agenda, and hence also for electors. This was an unfortunate positive feedback loop that reinforced in the media’s and the public’s mind the notion that the climate threat had diminished. It remains the most spectacular own goal in recent years (which is belatedly being recognised in some circles), though the effort of the Say Yes campaign in 2011 in giving an exclusive drop on the "Cate Blanchett" TV ad to the Murdoch media runs a close second. As a consequence, the opportunities to “connect the dots” between climate extremes in 2009-2011 and global warming was almost completely over-looked by the climate movement and eNGOs in Australia. (How could it be that organisations with professional communications managers missed that one?) In the case of the Labor governments, not making the connection was deliberate. A golden opportunity was lost. Record-breaking heat across the country and catastrophic wildfires in Colorado are giving environmentalists a rare opening to regain the political offensive on climate change… But it also represents a wider effort by activists to use this summer’s extremes as the basis for calls for action on climate change. For the green movement, the wild weather is a chance to show that oppressive heat and dangerous storms — and maybe even big winter snowstorms — are what experts believe nature has in store. “This is another sad chapter in connecting the dots, and there will be more chapters, unfortunately, and hopefully the story won't get too much worse before we finally do something,” said Bill Snape of the Center for Biological Diversity. “We have to talk about it. This is, unfortunately, an opportunity to do that,” said Snape, the group’s senior counsel. In Australia, by comparison, most of the climate movement was asleep at the wheel when presented with similar opportunities. Rudd’s strategic decision to isolate the Greens and deal with the opposition on the CPRS in 2008-09 kicked back in his face with the defeat of Malcolm Turnbull as opposition leader, unleashing the denier Tony Abbott into the second-highest-media-profile job in the country. A failure to act decisively. The sense of urgency was lost in 2008, according to Hugh Mackay, who says that the fall in public support is not due primarily to Gillard’s failures or even Rudd’s backflip. Mackay says the trend was evident by mid-2008, when the sense of expectation accompanying the change of government was deflated by inaction and low targets in the first six months of Rudd’s term, creating "a very critical vacuum" in which "people kind of shrugged and said well, it is not that serious after all ... It was seen as much more about a talking game than an acting game ... When we were not called upon to act, the opportunity was lost." Getting Copenhagen wrong. Despite the gathering evidence throughout 2009, Rudd and Wong bound their strategy to a good outcome at the Copenhagen climate meeting in December of that year, and when it all went belly-up they were devastated. And politically shot. Senior government figures thought they had a deal with Rudd to go to a double dissolution in early 2010 on the CPRS and before the worst of the Copenhagen fallout had rained down. But Rudd prevaricated and lost his nerve; then Gillard and Swan pushed him into a backflip on carbon pricing, and by June 2010 he was gone. Two backflips in five months. Gillard went to the August 2010 with a climate policy fit only for comedians, promising no carbon tax but "cash for clunkers" and a 100-person national consultation. Weeks later, and needing The Greens' and independent support to save her face and her government, she backflipped and set the Multi-Party Climate Change Committee in process. Given the nature of the coup against Rudd and the election result, Gillard’s credibility was half-shot before she started and her subsequent handling of the climate issue – evasive, dispassionate, disinterested, poorly commnunicated – did more damage to Labor’s credibility. And it probably also did damage to the case it was prosecuting: climate action. Weakening the legislation. Now it seems inevitable that the NSW Right faction of the ALP is using a beat-up on The Greens as a proxy for destabilizing and removing prime minister Gillard and returning to deposed-PM Rudd, in a deal which may see Rudd and the Right agree to weaken the carbon legislation and drop the minimum price. Having bagged Rudd unmercifully in early 2012 as unfit to lead, the very people who threw him out in a coup and installed Gillard in 2010 in a catastrophic failure of political judgement are now intent on doing it again, but this time in reverse. Strategic communications failure. In the report Brightsiding climate is a bad strategy, the catastrophic nature of Labor’s communications failure is discussed at length. It reached its logical conclusion when the 2012 advertising campaign in support of the climate legislation not only failed to provide a reason for acting (climate harm) but even failed to mention the reason for “compensation” the TV ads were about (the pollution tax). This will make a great textbook case study on how not to do it. It a country such as Australia, where net economic growth now is due largely to expansion of the mining industry, the power of the fossil fuel lobby is always on show: threatening; trashing proposed mining and carbon taxes; buying the media (literally) who are not sufficiently compliant; and funding delay-or-deny campaigns and industry organisations. Mining and energy ministers are rarely other than vassals rendering homage. Guy Pearce’s book High and Dry and his Quarterly Essay on Quarry Vision tell the story. With the recurring threat of international financial disorder, and most of Australia’s non-mining economy treading water, political dependence on the mining industry cargo cult may increase, foolish though that will be. Australia has bound itself into the neo-conservative frame of a deregulated economy – via free-trade agreements, a lack of financial and currency control, productivity and efficiency frames, and adherence to “small government” policies – to the whims and contradictions of a global capitalist economy now staggering from one crisis to the next. Whether the bank big bang is about to go off is anybody’s guess, but the chances are increasing. Once the neo-conservative paradigm is accepted as the foundation of policy-making, many of the measures necessary to save us from extreme climate harm are simply off the agenda. In their own works, both Nicholas Stern and Ross Garnaut have recognised this contradiction, without overcoming it, saying consistently that what needs to be done from a scientific point of view would be too economically disruptive. If it’s a choice between business-as-usual and an expanding fossil fuel industry, or acting to stop extreme climate harm, the former wins. We have witnessed this under the Howard, Rudd and Gillard governments. When courageous leadership was required, what we got was market tinkering. The "wisdom of the market" as embodied in the COAG Complementarity Principles developed in 2008 have become a reason for demolishing all non-price mechanisms for renewable energy, with the Productivity Commission, the major political parties and the economics commentariat all in furious agreement. Under this guise, both Labor and Liberal government have cut a wide range of energy efficiency and renewable energy programmes, including feed-in tariffs. Some are now lining up to trash the RET which, with the other cutbacks, would leave us worse off than before the carbon price was legislated. That such programmes are complimentary to a carbon price is not recognised. Nor is the fact that emerging industries need well-rounded industry policy and assistance. Yet we face the prospect of a vibrant clean energy sector being abandoned by industry policy-makers, while ailing fossil-fuel-intensive industries like car-making and aluminium have their pockets stuffed with taxpayers' money. No better example of leadership failure was the response to the Global Financial Crisis (GFC) in 2008. With few exceptions (South Korea being the most notable), most developed economies threw stimulatory spending at the problem with little or no integration with climate policy objectives. The GFC response showed governments prepared to save the banks but not the planet. In its wake, climate and energy programmes (for example FiTs) have been cut in many countries as budget balancing and “austerity” become de rigeur. There is no doubt that the GFC contributed to the failure at Copenhagen in December 2009, but was not the cause. The impact of the GFC directly on government priorities — but also on citizen’s concerns about immediate economic security — cannot be under-estimated in contributing to the diminution of climate as a first-tier issue. The primary barriers to the rapid acceleration of de-carbonization policies and programs are political rather than technological. The largest obstacles remain the influence of oil and coal interests working to protect their investments from being stranded as the tide turns in the direction of more renewable and sustainable energy supply options. At a time when clouds of economic uncertainty continue to hang over Europe, there is also an abiding danger of attention on climate change and other ecological challenges being overwhelmed by the more immediate threat of rolling financial crises. Looking at all these factors, it’s not difficult to see (following Hugh Mackay’s analysis) that public support for action was at its height as Labor came to power in December 2007 and has been sliding ever since 2008, abetted by the denier and Murdoch media campaigns, the GFC and Labor’s incompetence. A recent Lowry Institute poll reflects this view (below). Walking Against Warming was probably at is biggest and brightest in 2007-08. Commitments to carbon pricing and increasing the RET were made before Labor won power. The sun was shining brightly for urgent climate action in 2007-2008, when carbon pricing in Australia started its journey. By the time it was legislated in 2011, the light was fading. If that is the case, the climate and energy policies now legislated may have less to do with what eNGOS and the climate movement did in 2008–2011 that what happened in 2007 when Rudd in opposition appointed Garnaut, and what happened after the hung parliament result in 2010. It was Garnaut who drive the process (with limited terms of reference) from 2007 onwards, with a quirk of history in 2010 thrown in. It was the Greens and the two independents who put climate back on the agenda and made the passage of the climate legislation possible. In retrospect, the 2009-2010 year takes on particular significance. As that period started, Australia was gripped by drought, citizens lived with water restrictions (and seemed to accept such utility rationing as fair and necessary), and unprecedented fires and record temperatures had left on indelible mark on most Victorians. Hopes were high that Ross Garnaut’s report would soon result in climate legislation passing parliament, whilst Copenhagen would represent a stepping-up of commitments. But Copenhagen failed, Rudd’s linking of Australian legislative aspirations to it back-fired, and soon it was time for a new PM. By late 2010 the Australian story was of record rain and floods, and Cyclone Yasi. In just over a year, the story had flipped, just like Rudd and Labor. It was clear after Copenhagen and Rudd’s backflip that the game had changed, but the big NGOs were slow to recognise it. If they had, they would have devoted significant resources to re-invigorating public concern through community education and organising (perhaps in the manner of Your Rights at Work), but they did not. A priority on operating inside the Canberra beltway and managing the media cycle continued to take precedence over spending serious resources in the field to build community support. Such activity received little or no assistance from the national eNGOs and their e-lists of contributors and supporters continued to be treated as money-and-tick-a-box fodder. There have been exceptions, such as GetUp’s efforts in organising locality-based meetings of supporters on climate in a pre-election period. It seems important to re-try this work more systematically with the larger eNGOs pitching in to help build, and support, existing local community campaigns, and providing sufficient resources to sustain the effort. On the other hand, GetUp’s efforts on the 5 June 2011 rallies were a great example of how not to do it. Australia’s climate action sector is diverse, ranging from big, national organisations with annual budgets in the tens of millions, through smaller and more nimble state and regional bodies and semi-professional advocacy campaigns, to completely voluntary locality-based community groups. Whilst it is hard to generalise, there has been inadequate talking and decision-making across the whole sector, even taking some serious differences into account. Certainly there has been no effective and continuing united front as has generally the case with big issues for the trade union movement, for example, or historically over a range of significant social and environmental campaigns. As a consequence, strategies, priorities, campaign objectives and public messages have been inconsistent. There is a bit of a look-at-me, post-modernist sense to much of this: a scatter of groups with the “best” approach often talking past each other, with branding and corporate imperatives and marketing-driven bright-siding winning the battle over the need for a strategically sound, united approach. I don’t think I have ever witnessed an extended discussion amongst community climate groups on what to do about the parts of a city or large region where there are no community climate groups, and the development of a plan, tools and resources to address the problem: the part has taken precedence over the whole, in the sense that no organisations or unified structures take responsibility for the whole. The rise and dominance of professional, non-for-profit advocacy organisation creates a new structural challenge. With reliance on private and business donors and government funding, such groups often place communications specialists and marketeers above campaigners in the hierarchy, so all that is said and done builds a brand identity. It’s hard not to conclude that donor dependence, political allegiances and branding imperatives often triumph over good politics. When it comes to “united” action, there is a compelling reason for each eNGO to sell their view, with their CEO, to their supporter base and the media, rather than the story as a whole. This is a systematic problem that bursts into spectacular damage on a number of occasions, such as the role of the Southern Cross Climate Coalition in 2009. The change we need is not going to happen to without mass civic participation and a people power’s movement for transformation. We must all help to build this, because it is fatuous to believe that government or business will take the initiative to confront and overturn the neo-liberal paradigm that condemns their politics to failure. It is here that the big advocacy groups such as ACF, WWF and Climate Institute are already facing a stark choice between a pollcy-first or power-first strategy. Should they primarily stay inside the Canberra beltway, do make-a-video-tick-a-box-send-an-email-give-us-money but fail to empower their membership and supporters or, on the other hand, put serious resources into supporting community organising, spend less time competing as brands in the climate advocacy supermarket, and share resources to help build mass civic participation? Cognitive dissonance is growing because what needs to be done cannot be achieved in today’s neo-conservative capitalist economy. A rapid transition will required a great deal of planning, coordination and allocation of labour and skills, investment, and materials and resources, that can’t just be left to markets and pricing. There is a choice between two dystopias: some very significant social and economic disruptions now while we make the transition quickly, or a state of permanent and escalating disruption as the planet’s climate heads into territory where most people and most species will not survive. Our task now is to chart the “least-worst” outcome. So this will not be painless, and the mass of the population will need to actively understand and participate in some personally-disruptive measures, but they will do so because they have learned that the transition plans are both fair and necessary, and the other choice is unspeakable. Paul Gilding addressed some of these issues in The Great Disruption, but few were prepared to continue the conversation. The concluding Part 3: Challenges will be posted soon.